Ad from Shaping Alberta's Future, which has raised nearly $300,000 in recent months. This is the Wild West — and not the fun Stampede kind. This feature is part of The Sprawl's Alberta Election Edition. Become a Sprawl member today and support independent Calgary journalism! The Sprawl is crowdfunded, ad-free and made in Calgary. In Alberta, third party advertisers (TPAs)—or political action committees (PACs)—fund a lot of ad campaigns. But who are these groups, and how does their funding play into influencing the Alberta election? TPAs are people, groups or organizations who need to register with Elections Alberta once they've spent more than $1,000 on advertising. After the NDP banned corporate and union donations in 2015, the money started flowing to PACs instead. 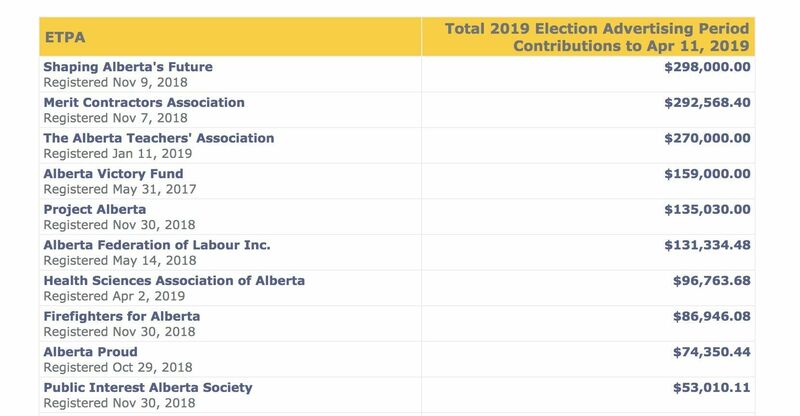 PACs in Alberta have taken in more than $1.4M since December 1 and include organizations such as Merit Contractors Association, the Alberta Teachers’ Association, Alberta Victory Fund and the Alberta Federation of Labour. Third-party advertisers who have raised the most since December 1, according to Elections Alberta. On social media, the influence of PACs is amplified. Using Facebook and Twitter, they’re able to spread information quickly and get people involved, on top of running aggressive ad campaigns. And while there are caps on how much they can put into advertising, posting on social media doesn’t count—with the exception of paid posts. Which basically means this is the Wild West, and not the fun Stampede kind either. They are self-described as “a free market-oriented” PAC. Shaping Alberta’s Future is rallying behind Jason Kenney and the UCP. 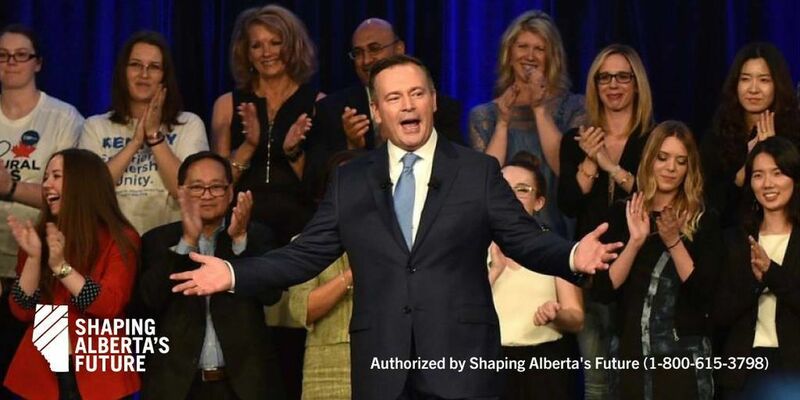 After the NDP’s win, Shaping Alberta’s Future started promoting standard conservative values, such as free enterprise and limited government. Their goal: “defeat the NDP in the next Alberta election.” The PAC also runs the attack website NDPfacts.ca. Shaping Alberta’s Future has brought in more than any other PAC, with a cool $298,000. All of that sweet maple-syrup scented cash comes from a mix of corporations and individuals from Edmonton, Calgary, Lethbridge, Medicine Hat, and a few smaller towns. Among the contributors are Surge Energy Inc., Crew Energy Inc. and La Crete Saw Mills, to name a few. Having deep-pocketed contributors on board means Shaping Alberta’s Future has become one of the most influential PACs in the province. While they only have a little over 4,200 likes on Facebook and 1,475 on Twitter, their connections to the corporate world means that their reach goes beyond the social media world. And they’ve been able to use all of that money to generate a mass of UCP-friendly content. Saving Alberta’s Future couldn’t be reached for comment. On the opposite side of the spectrum, Progress Alberta is the left’s answer to conservative election advertising. Duncan Kinney, executive director of Progress Alberta, describes the organization as a “hybrid” of both online and person-to-person advertising and education. It’s pretty easy to identify what they stand for: diversity, a healthy environment, government for the people rather than for corporations, condemning the alt-right—standard progressive stuff. Unlike their conservative counterparts, Progress Alberta is relatively strapped for resources. With their “hybrid” model, they spend less on creating content and ads for social media and put a focus on interacting with Albertans offline. According to their disclosures, they’ve raised $6,500.00 from two union contributors—CUPE Local 37 in Calgary and Unifor in Edmonton. With a combined following of just under 14,000 across their Facebook and Twitter, Progress Alberta definitely has some pull on social media. “The goal here is to identify supporters and people who share our values online more than anywhere else, and then and then actually get them to do politics,” Kinney said. Well, they’re proud of Alberta, that’s for sure. If the name feels like it’s ringing a bell, that’s because it is—you may recognize the “Proud” brand from the Eastern Canadian organization: Ontario Proud. And while spokesperson and content creator Haley Love said that the two organizations are separate, they share the same values and goals. And what are those values? Alberta Proud is very conservative, promoting things like pipelines, keeping government out of Albertans’ business and disagreeing with Prime Minister Justin Trudeau on pretty much everything. Love said that they’re a small team based out of Calgary and spend most of their efforts creating graphics, videos and sharing articles. Their year-to-date report of quarterly contributions (December 1, 2018 to April 4, 2019) come in at $74,000 with the largest contributions coming from corporations like Source Energy Services Ltd. and private individuals. With well over 172,000 likes on Facebook, Alberta Proud has incredible reach and it has a lot to do with the way that they share and post their content. In addition to posting their original graphics, photos and videos, they incorporate some very shareable general Albertan content like photos and memes about how “nice” Canadians are. This means that they’ve attracted an audience that may not have any idea that they’re involved in election advertising at all. This puts their reach well beyond the standard echo chamber that PACs tend to exist in. 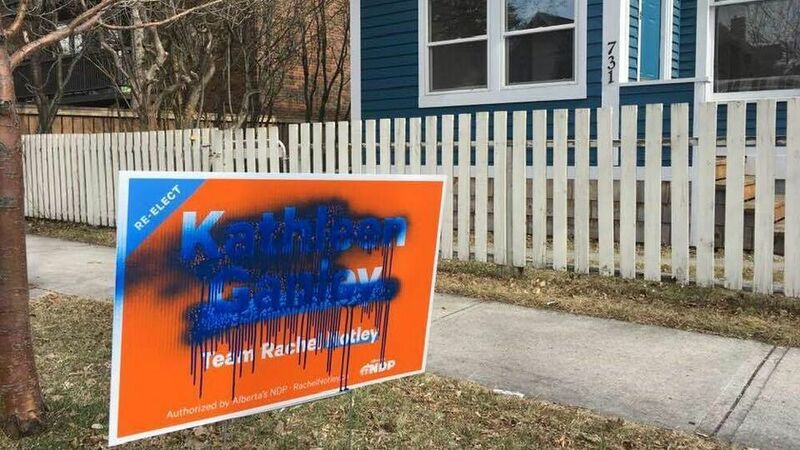 And while Love said that Alberta Proud isn’t in support of or against a particular party, it’s evident from all the anti-NDP articles and Trudeau memes they’ve been sharing that is probably not the case. Alberta Can’t Wait is a private company that was established after a group of “everyday Albertans” gathered in Red Deer to express their distrust of the NDP. According to their website, Kenney once thanked them for uniting the conservative movement across Alberta. Beyond their distrust for the NDP, their main mission is to ensure Alberta has a conservative government after April 16 And despite the common theme of not being for or against anyone in the election, Alberta Can’t Wait has made it pretty clear that they support the UCP. Alberta Can’t Wait isn’t currently listed as a TPA on the Elections Alberta website, and as a result their financial records aren’t available. 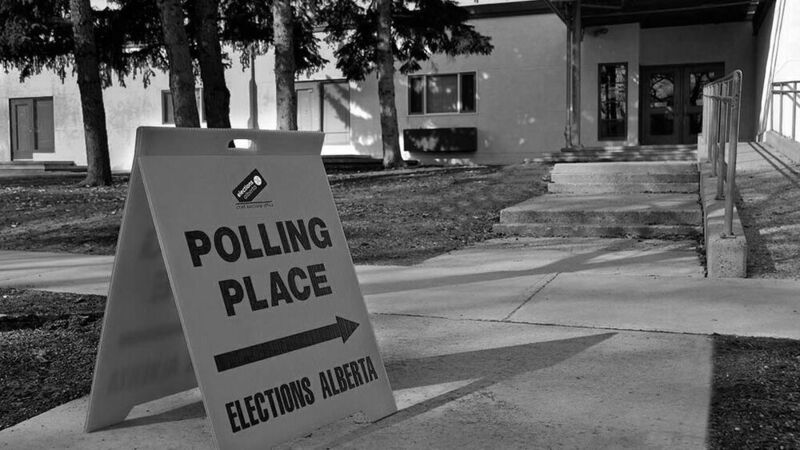 Prem Singh, the media contact for the organisation, said earlier this year that Alberta Can’t Wait wouldn’t be active in the election, is doing no advertising and has no involvement. Despite being officially inactive as an advertiser, they still do a lot on social media. They currently have more than 78,700 likes on their Facebook page and more than 7,200 followers on Twitter. Between their daily negative Notley posts, conservative memes and hyping up all things pipeline, Alberta Can’t Wait is very active in its sharing and influence. Unite Alberta isn’t a PAC, although it looks like one. It started out as Kenney’s leadership campaign back in 2016 after the NDP’s win. According to some digging done by Progress Alberta, Unite Alberta was being advertised as a non-profit on Kenney’s campaign website. Both Unite Alberta’s and Kenney’s campaign website have since been taken down, and upon further inspection it’s evident that Unite Alberta was actually registered as a corporation. Unite Alberta is not listed as a third-party advertiser with Elections Alberta, which means that the organization is essentially just a Twitter account at this point, with the main purpose of ensuring that no one comes for Kenney. When Unite Alberta first began looking for funding back in 2016, the campaign welcomed donations from all Albertans. Kenney even took it on the road for the “Unite Alberta Truck Tour,” which features a lot of photos of Kenney in a blue truck. The Twitter account currently boasts over 8,300 followers and they don’t exist on Facebook. They are one of many UCP Twitter accounts. The account is often used to try and discredit Kenney’s critics. Unite Alberta couldn’t be reached for comment. Correction: We originally stated that Alberta Proud is based out of Edmonton; in fact they're based in Calgary. This story has been updated accordingly. Hadeel Abdel-Nabi is a freelance journalist and writer based in Calgary. Her work has been published in VICE, Avenue Calgary, HuffPost and elsewhere. The Sprawl is crowdfunded, ad-free and made in Calgary. Become a Sprawl member today and support independent, ad-free Calgary journalism! But there is one similarity. At the end of all this, we’ll need compassion.